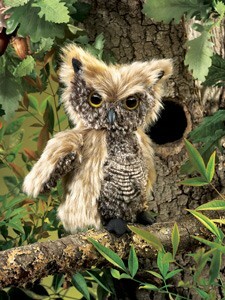 Folkmanis 2961 - Feathery tan and grey plush mimic the soft, silent feathers of the SCREECH OWL puppet so realistically that they almost camouflage this woodland creature. With the hidden rod, turn his head to fix his watchful eyes on you! Measures 3” long, 3” wide, 6” tall. Hand puppet internal rod rotates head.